The Toto Ultramax one-piece toilet comes with most of the features that people desire in a modern toilet, but it is also quiet in operation. Just like many other Toto toilet models, the Ultramax toilet is made of vitreous china, and it is extremely durable. And, the Toto Ultramax price is lesser than the Toto Ultramax II. Read this Toto Ultramax review to know more about this one-piece toilet. Related: Toto Ultramax VS Ultramax II: Which Toilet You should Buy? The powerful G-Max flushing system is very effective in performance and doesn’t leave behind any wastes. It uses 1.6 gallons of water per flush, and the larger trapway ensures nothing that goes down comes back. This toilet is comfortable as it has an elongated bowl design. Cleaning isn’t a problem as well as the SanaGloss ion barrier finish keeps it clean after every flush. 4 Summary: Why buy Toto Ultramax Toilet? The toilet is easy to install as it comes with a 12-inch rough-in. it also weighs 93lbs with measurements 28 x 17 x 28 inches. 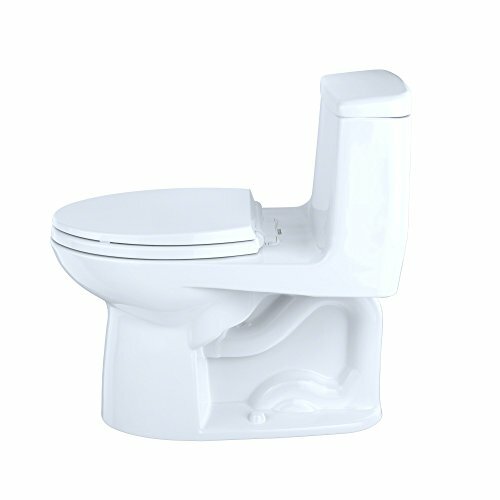 Being a one-piece toilet design, it is quite heavy and you will require help in order to install it. Check the usual manual to help guide you during installation. Alternatively, you can hire a professional plumber to install the toilet. Toto has made a stride when it comes to durability. Past users of the Toto Ultramax one-piece toilet highly applaud it for its outstanding durability. Made of vitreous china material, this is a toilet that will last for more than 20 years. Thus, it is a great investment and you won’t have to purchase or replace it with any other toilet anytime soon. Apart from that, the Ultramax one-piece toilet is a stylishly designed toilet with a seat included. Unlike some Toto toilet models, you won’t have to buy the seat separately. Another outstanding feature of this toilet is its SanGloss finish, which gives it a sleek and sparkling look. With the vitreous china material, this is a toilet that you can count on to use for over a longer period of time. If you’re tired of flushing your toilet more than once for it to clear the contents in the bowl, then, Toto Ultramax toilet will be a great option for you. The G-max flushing system is the industry benchmark for flushing performance. It will clear both solid and liquid wastes in just one flush and leave the toilet sparkling clean. This is all thanks to the larger 2,1/8-inch glazed trapway that provides increased flow, drawing water into the bowl faster and then away with greater force to avoid clogging. In addition to the larger trapway, the toilet comes with a 3-inch flush valve that creates a quicker, quieter and more forceful flush that clears all the waste in the bowl. The extra large siphon jet creates great power for one-flush superiority to ensure that what is pushed down remains down. The Toto Ultramax toilet not only features a powerful flushing mechanism, but it is also easy to clean. The powerful siphon jet clears contents in just one flush, leaving the toilet clean and without dirt. The SanaGloss ion barrier also plays a major role in keeping the toilet clean as well. It makes sure that nothing sticks on the toilet after every flush. Moreover, it makes the toilet to look sparkling clean and as a result, you’ll not have to scrub your toilet hard in order to remove the stains and dirt. Being a one-piece toilet, cleaning the entire toilet will be swift as there are no hard to reach areas. Whether your bathroom is of modern or traditional design, this toilet will still fit in perfectly. 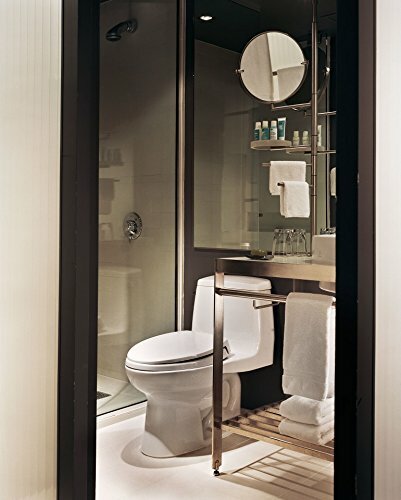 The Ultramax one-piece toilet is excellently constructed with a sleek design. It is easy to fit in the bathroom as it has a 12-inch rough-in. In addition, the elongated bowl design provides enough sitting space for users. The manufacturer offers a variety of colors to pick from which include bone, cotton white, colonial white, and Sedona beige. Most people prefer cotton white because it easily matches with most interior décor. The days of banging or slamming the toilet seat are over. The Ultramax toilet has simplified things for its users as it has a SoftClose. After using the toilet, the seat will close slowly without slamming. The seat and lid use a built-in SoftClose hinge system, which lowers the seat down to the bowl slowly and quietly. If you’ve kids at home, this may not be the best toilet to install as the toilet seat may need to be replaced almost every year. Though not the best warranty around, Toto’s one year warranty is nothing when compared to the quality of its toilets. Previous users have high praise for Toto toilets as being one of the most durable on the market. But the manufacturer should improve the warranty to increase confidence in new buyers. Summary: Why buy Toto Ultramax Toilet? It is difficult to clean the hidden parts of the toilet, where bacteria and dirt may hide. Overall, the Toto Ultramax toilet is a good addition to most bathrooms and it is very easy to maintain. The powerful G-max flushing system, together with the SanaGloss ion barrier ensures that nothing sticks on the surface of the toilet. No need to flush twice with this toilet as the powerful siphon jet will make sure the waste is cleared in just a single flush. The toilet is also quiet in operation and won’t distract people or create unnecessary attention. However, it is quite expensive and the one year warranty should be worked on. Besides these, this is a sleek and comfortable toilet to have in the house. I have explained everything in this Toto Ultramax review that you need to know. Question: How do I know whether the Toto toilet model I am buying has a SanaGloss finish or not? Answer: This is a good question and many people are not aware of it, only to find out later. To know if the toilet has a SanaGloss finish or now CEFIONET glaze, check its SKU number. For instance, for this model, it should be MS854114SG. If the SKU number doesn’t have SG in the end, then it doesn’t have a SanaGloss finish. Question: I have a 10-inch rough-in, will this toilet fit in? Answer: No, it won’t. Toto makes most toilet models with either a 12-inch rough-in or a 10-inch rough-in. But for this particular model, it only comes with a 12-inch rough-in. So, if your toilet has a 10-inch rough-in, you will have to consider buying another Toto toilet model not named Toto Ultramax toilet. Still, have a question after reading this Toto Ultramax review? Comment below.